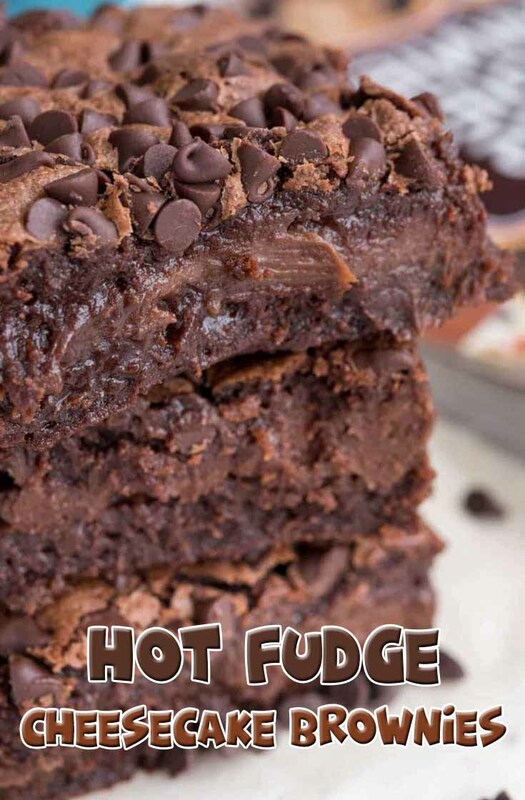 Make the brownies: Place the butter and 1 1/4 cups chocolate chips in a large microwave safe mixing bowl and heat on high power in 30-second increments, stirring between each, until melted and smooth. Stir in cocoa powder until completely incorporated. Add both sugars, vanilla, and salt, stirring to combine. Stir in eggs, one at a time, until completely mixed through. Gently stir in flour until incorporated and no more flour is visible. The batter will be thick. Carefully layer the rest of the brownie batter on top of the cheesecake layer. (It's best to drop spoon the batter evenly over the top and then spread to avoid mixing the layers together.) Sprinkle with mini chocolate chips, regular sized chocolate chips, or chopped peanut butter cups. Bake for 30-38 minutes until the brownies are set with just a little wiggle in the center and they are starting to pull away slightly from the edges of the pan. Cool completely then chill at least 2 hours before cutting. Store in refrigerator in sealed container.